June 12 – 24, 2017: AO Group Show. The ARTS Project. 203 Dundas St. London, ON. CANADIANA. Opening Reception June 17, 2-4 pm. Ongoing all year: AO Exhibit at Ingersoll Public Library – changes periodically, with different artists being featured each time. September Annual AO Membership Meeting: Wednesday September 21, 2016, 7 pm at Woodstock Art Gallery on the main floor. Tues. November 22 at Ingersoll Creative Arts Centre. 7 pm. Annual AO Holiday Potluck: Friday December 16 at 4 pm at Lianne’s house. Wednesday March 22 at Woodstock Art Gallery, 7-9 pm. Informal, no business meeting. We will take part in the Life Drawing class being held there that evening. Bring sketch pad and drawing material, maybe an easel if you have it. $15 per person unless you are a WAG member or already have paid for the class. Thursday April 20 at the Tillsonburg Station Arts Centre. 7 pm. Informal, no business meeting. Talk and demo of abstract art by Rita Milton. Thursday May 18 at the Ingersoll Creative Arts Centre. 7 pm. Informal, no business meeting. Bring equipment and watermedia. February 7 – March 6, 2016: AO Group Show. Ingersoll Creative Arts Centre. September Annual AO Membership Meeting: Wednesday Sept 16, 2015 at 6 pm, at Woodstock Art Gallery, 3rd floor. Membership fees are due for the new AO year. At 7 pm the Juror’s Critique for the Visual Elements 57 Exhibit is taking place at the WAG, if you care to attend it. November 18. Ingersoll Creative Arts Centre, 7 pm. Demonstration: Art Therapy by Margaret Douglas. December 17. Sue Fenlon’s home, 5:30 pm. (For address please contact us). Annual holiday potluck. March 23 2016. Woodstock Art Gallery, 7 pm.March 23 2016. Woodstock Art Gallery, 7 pm. Esmeralda Carvalho will talk on “Promoting yourself online and offline”. Cathy Barzo will have a segment on Etsy, an online store. Event Cancelled – we will try again later this summer! Plein Air Painting: We will be meeting sometime during the week of May 11, 2015 for plein air painting at sites in Otterville. Tentatively scheduled for May 11 at 1:30 pm, meeting at Lianne Todd’s house. Dependent on weather conditions. Note: Above event did take place in Otterville on August 12, meeting at corner store. We’ll hear about it at the Sept meeting. September Annual AO Membership Meeting: Wednesday, September 17, 7pm at the Woodstock Art Gallery in the Community Gallery. Speaker: Troy Ouellette. Topic: New Materialism, Assemblage Theory in Relation to Creativity. All are welcome, attendance is free. Members: Please don’t forget that membership fees will be due soon and are payable at this meeting. Thursday, October 23 7-9, at the Tillsonburg Station Arts Centre. Speaker: Heather MacIntosh. January and February – meetings will be done by group chat on Facebook, or by email. Wed. March 18th 7-9 , at the Woodstock Art Gallery. Speaker: Mary Reid, new curator for Woodstock Art Gallery. Thursday, April 16th 7-9, at the Tillsonburg Station Arts Centre. Speaker: Lianne Todd – topic: contributing to the website. Also, we will have a Show and Tell – bring a work in progress or recently finished piece. Wed. May 20, 7-9, at the Ingersoll Creative Arts Centre. Speaker: Ken Sanford from Chops. Topic: framing. May-June 2014. “Phases” – AO exhibit at Woodstock Art Gallery, Sheila Perry curator. September Annual AO Membership Meeting: Thursday September 19, 7 pm, at the Tillsonburg Station Arts Centre. Speaker: Mary-Anne Murphy of Oxford Creative Connections, Inc. Membership fees are now due. Wednesday October 23, 2013, 7 pm, Ingersoll Creative Arts Centre. No speaker scheduled. Shirley Hokke spoke about watercolour artists Atanur and Asuman Dogan and the International Watercolour Society. Lianne spoke about her method of photographing paintings. Holiday Pot Luck Dinner: Tuesday December 3, 2013, 5 pm, Woodstock Art Gallery – Speaker Sheila Perry, new curator of Woodstock Art Gallery. Thursday, January 23rd. 7-9 pm, Tillsonburg Station Arts Centre – speaker TBA. Bring pieces to be juried into show at TSAC. 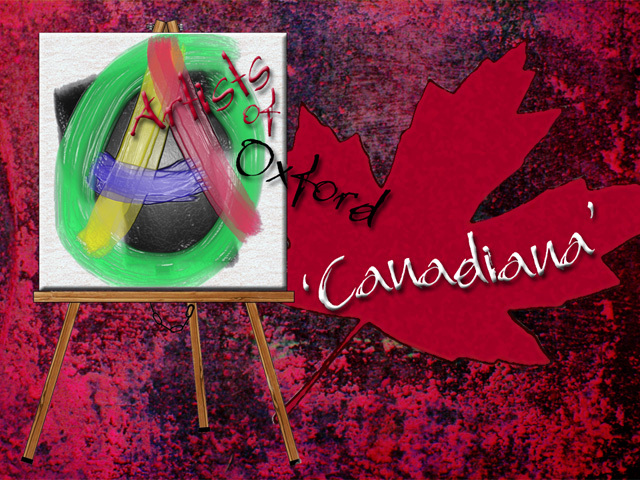 April 9 to July 23: “The Artists of Oxford” featured by Oxford Creative Connections Inc. in travelling exhibit starting at the Elm Hurst Inn & Spa, Ingersoll, continuing to Community Employment Services, Woodstock, on May 14 and to Woodstock Hospital Gallery on June 18. Wed July 3, Paint-Out and Pot-Luck. 2:30 pm – ?evening at Linda’s place. Painting first, then food (sandwiches and salads) and fire-pit. Details in membership emails, ask a member if you would like to join us. Rain date July 17.